We can’t really say it snuck up on us, but New England’s electricity infrastructure is already prone to supply interruptions and price spikes, and getting more so. And so far the steps to counter the problem have been very limited. There’s a new warning from the non-profit company that operates the six-state grid, the Independent System Operator – New England (ISO-NE). One easy work-around – building gas plants that can run on oil in a pinch – is getting harder to use, because of air pollution rules, according to the head of the organization, Gordon van Welie, president and chief executive. His warning came in ISO-NE’s annual update on the state of the region’s electric grid. The result is a loss of energy diversity that threatens the stability of supply and price, according to van Welie, who spoke to reporters on Jan. 30. 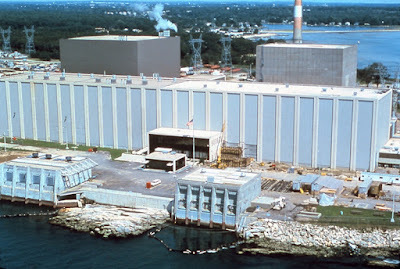 Among the elements in this unhealthy trend are the premature closings of two nuclear reactors, Vermont Yankee, in December, 2014, and Pilgrim, in Plymouth, Mass., which is scheduled to close in 2019. In this context, the future of the Millstone Power Station takes on new significance. Generators don’t get paid for contributing to the healthy diversity of the system, but the New England system is more likely to run into trouble because of its reduced diversity, and part of Millstone’s value is that it doesn’t need pipelines or coal trains. In fact, at any moment it’s got months of fuel already on site. The Independent System Operator says it doesn’t favor any technology over any other, and it doesn’t have financial ties to any particular form of generation. It doesn’t own any generating stations or transmission lines, and can’t order anybody to build either one of those. All it can do is point to emerging problems. And in the electric business, you have to point early, because it takes a while to bring anything new on line. The ISO market has benefits. Prices are down, because of competition, and because of very low natural gas prices. But the market structure doesn’t consider diversity. It may be time for some new policy guidance, this time by the legislature in Hartford, where pending legislation would allow Millstone to compete to reduce retail electric rates. If the legislation is passed, Connecticut will reduce retail electric rates and will have the benefits of all of Millstone’s attributes – carbon-free generation, around-the-clock production, and fuel diversity. The above is a guest post from Matt Wald, senior communications advisor at NEI. Follow Matt on Twitter at @MattLWald.